Talking about cracked teeth is sometimes confusing. There are several types of cracked teeth. The treatment and prognosis of a cracked tooth depends on the type, location & severity of the crack. Types of cracked teeth include: craze lines, fractured cusps, cracked tooth (restorable type and non-restorable type), split tooth & vertical root fracture. A split tooth is caused by a cracked tooth that has gone untreated over a period of time. 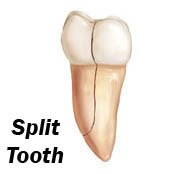 The tooth is literally split into two pieces by a crack that runs through the tooth. 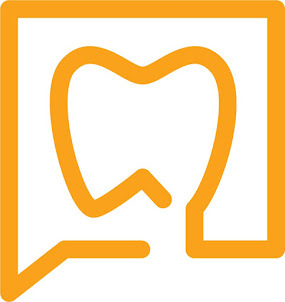 A tooth can be split mesio-distally or linguo-buccally. The crack of a split tooth includes damage to the root itself. The crack of a split tooth can be seen crossing the floor of the pulpal chamber. This is a sure sign of a non-restorable tooth. The following case is an example of a split tooth. This patient presented for endodontic therapy. #15 had a small occlusal amalgam. The tooth is diagnosed as necrotic with symptomatic apical periodontitis. Close examination of the occlusal surface shows a stained crack on the mesial & distal marginal ridges. You can see that the lingual and buccal surfaces of the tooth have been flexing for an extended period of time. The clinical appearance of this tooth strongly suggests a split tooth. In this case, the patient was informed of the probable non-restorability of this tooth. 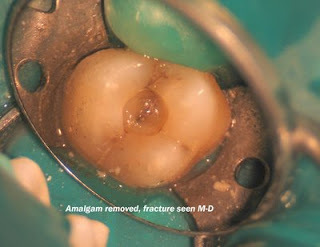 Removal of the amalgam shows the connection between the MMR & DMR cracks. The argument for a split tooth becomes even stronger. 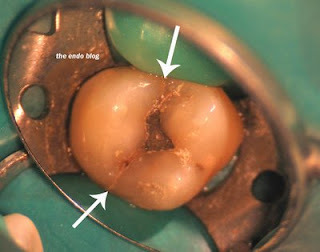 After access into the pulpal chamber, the cracks can be traced down the mesial and distal walls and then connecting across the pulpal floor. The diagnosis of split tooth is now confirmed. 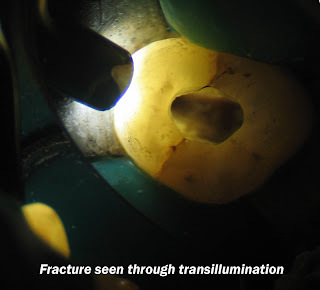 Just for fun, transillumination is used to show the cracks. Tooth was referred for extraction. I saw someone the other day who had a small area of opalescence on the occlusal surface on the MB cusp of #19 (which had an occlusal amalgam restoration). The moment I touched the spot with the explorer, the patient jumped. On the buccal surface at the MB line angle of the tooth, there looks like a shadowy line is running down the tooth towards the CEJ. The tooth is otherwise asymptomatic, nothing abnormal is there radiographically. Are those signs of a crack? What do you do if you would have a similar case but the fracture was not through and through the furcation i.e. just in the mesial or distal marginl ridges (or both but not the furcation)? That is a great question. There are probably several philosophies about how to treat that. If I can see that the crack/fracture goes down into the depths of the root, or crosses the pulpal floor, then I recommend extraction. 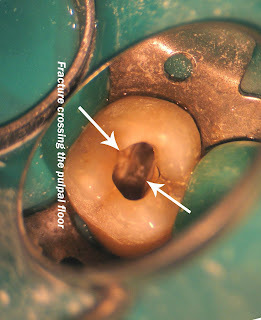 If the crack just goes down one pulpal wall but does not cross the pulpal floor, I usually explain that to the patient and let them decide if they want to try and save the tooth. I explain that the new crown may not completely cover the crack, but that the other option is to extract. I have found that if the patient is given the option to try and save the tooth, understanding the limitations, many times they want to try and save the tooth. I try to give them enough information to make an informed decision. I do not condemn a tooth just because it has a crack in the wall. Yes that sounds like it could be a crack. Usually I see most crack on the mesial or distal marginal ridges or the straight buccal or lingual surfaces. Have you tried checking for pain to biting? Use a tooth slooth and check each cusp for pain to biting. If you get pain to biting and the tooth is testing normal (healthy) to pulpal testing, then I would call it a cracked tooth syndrome and recommend a crown/onlay for cuspal coverage. I would also warn the patient that the pulp may be irritated/inflammed and still could need endo tx if symptoms appear following crown preparation/placement. Tooth 5 had chipped about 2 years ago. The dentist filed it down and put a crown (No root canal though). Everything was good, but then about 3 months ago I noticed the tooth was sensitive to biting, but only when it hit a certain part of the tooth. I opted to have a root canal even though there was no sign of abcess.The first 2 days were OK. But then pain set in. In particular pain above the tooth. It was even worse if you pressed on the gum area above the tooth. Gave it a month, no major improvement. Endodontist re-did the root canal to see if there was something missed. Again, the first 2 days were great. I thought the problem was fixed. No pain at all. Then 2 days later, bam. Same thing. The pain comes and goes. It also hurts when you press on the gum area above the tooth. The endodontist swears there is no infection, and doesn't think the tooth is cracked. There is no abscess either. He says to give it a few more weeks. It's been just over 1 week already since the re-treat. I thought the pain was getting better, but today it seems I am back at square one. I am still on the antibiotics. Have a few more days left. Please help. It really is difficult to say what is going on my a description alone without see it or the radiographs. However, I am glad to see that you have found an endodontist, who appears to be doing everything to help you save the tooth. After re-treatment, if the tooth will not settle down, the next step would be to do an apicoectomy. There are some teeth, because of their anatomy, that cannot be completely cleaned by a regular root canal. In these cases, root canal surgery is a treatment option. What works in such cases (have some 5 years observations) is to do the root treatment and make a crown. If the tooth is covered with the crown rim the fracture "settle" and tooth gives no problems. Of course I start with temp crowns for 6 months and check the x-ray after to decide to go on with the final one. Gosh, hasn't anyone see a split tooth heal in a human, caught early and (temp) crowned, no RC? In dogs after 2 weeks a crack starts healing on the pulpal side, and after the 3rd week the periodontal ligament starts sealing the root crack with cementum to form a callus.